We have no substantial evidence of the state of musical culture and the forms of music and singing in the Bohemian Lands before the advent of Christianity. Latin sacred songs (cantiones) were composed by both clerics and students [Info] [Sample]. They spread to Central and North Europe at the end of the 14th century and were successively translated into Czech, German and Flemish. In addition to the simple strophic songs the genre included more refined and complex forms, such as lais (Germ. Leich), e. g. O, Maria, matko Božie [Oh Mary, Mother of God, CD1-4]. In the 14th century the Latin sacred Easter plays were also translated into Czech and performed (together with what were known as the Plaints of the Virgin Mary) at schools and during Corpus Christi processions, although the Church authorities tried repeatedly to ban the practice. Secular music and song undoubtedly existed from earliest times but up to the 13th century there are only obscure references to it in the chronicles and we lack reliable testimony and musical sources. In the 13th - 14th century, a number of well-known German minnesingers were certainly present at the royal court of the last Přemyslids and then the Luxemburgs to sing the praises of the Czech kings (Reinmar von Zwetter and others), while others would certainly have been known here (Neidhardt von Reuenthal, Heinrich von Meissen, known as Frauenlob, Heinrich von Mügeln etc.). The great French poet and composer Guillaume de Machaut was in the service of King John of Luxemburg, but it seems to be unrealistic to assume he had much effect on the Czech culture of the time. From the 14th century we have records of Czech love songs of courtly type (Dřěvo se listem odievá [Trees Are Putting on Leaves CD1-5], the so-called Song of Záviš Jižť mne všě radost ostává [All My Joy is Waning]), but in most cases the texts have survived without the music. Polyphony first entered the church liturgy as a tolerated "decoration" of the monophonic chant. The improvised organum was probably cultivated in clerical communities (chapters, monasteries) from as early as the mid-12th century. We have written records of it (i.e. „pieces fixed in the process of oral tradition) from the end of the 13th century (Kyrie, Sanctus, hymns [Info] [Sample], tropes for the Benedicamus domino, lessons for the Offices and Mass), and some of these pieces were in use right up to the end of the 16th century! The more elaborate mensural polyphony likewise spread into the Bohemian Lands probably from the end of the 13th century and developed its own specific genres there on the (mediated) models of the music known as (French) ars antiqua - songs of conductus [Info] [Sample] type and polytextual motets. In Europe beyond the Alps these were only two-part forms, and in the Bohemian Lands they were gradually "modernised" - especially the motet - by the addition of further parts (from three to five), by transformations of rhythm and metrics and so forth. Otherwise, after the mid-14th century the influence of French ars nova (a new system of notation was explained "to Prague students" in an anonymous treatise of 1369) reached the Bohemian Lands. Indeed, the cultivation of contemporary polyphony seems to have shifted to the sphere of the schools and Prague University, from which the musical theory of the time (including a kind of "textbook of musical forms"), and knowledge of contemporary French music, to a lesser extent Italian music and home compositions (the isorhythmic motet Ave coronata-Alma parens [Info] [Sample]) spread to other Central European universities as well. Unfortunately this contemporary polyphonic music appears to have remained "the property" of learned men, students and clerics and not to have attracted the interest and support of the court and nobility. 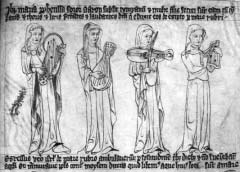 The cantilena songs for which Machaut became famous in an aristocratic society that cultivated the courtly love lyric, continued to be bound to sacred texts in Bohemia. 1348 Charles IV founds a university in Prague. 1378–1417 schism in the church; from the mid-14th century criticism of church abuses (such as sale of “indulgences”) grows in the Bohemian Lands, together with an emphasis on inner piety; inspired by “heretical” teachings of the period (John Wycliff), reformist thinkers and preachers come to the forefront (M. Jan Hus preaches in the Bethlem Chapel from 1402, from 1414 there is a campaign for communion in both kinds for the laity (symbolised by the chalice). The fifteen-year Hussite period (1419-1434) had a serious impact on musical culture in the Bohemian Lands, involving as it did the overthrow of church institutions (the dissolution of many monasteries, the emigration of monks), many and various transformations of rites and liturgy, ideological disputes about the permissibility and form of polyphony in the religious service etc. 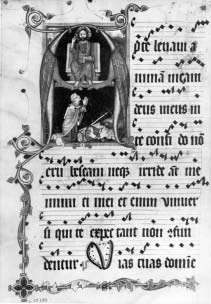 One notable achievement despite the disruption was a relatively sensitive and effective experiment in translating the Gregorian Chant from Latin to Czech (in what is known as the Jistebnice Hymnbook c. 1420). There was a huge upsurge in songs about current events (Ó svolánie konstanské [Oh, Council of Constance, CD1 9]), war songs (Ktož jsú Boží bojovníci [You Who are God's Warriors], Povstaň, povstaň, veliké město Pražské [Arise, Arise Great City of Prague]) and religious songs. In the wake of the Hussite Wars, the Emperor Sigismund confirmed the legitimacy of two religions in one state, a move that was to be reflected in the liturgical music of the next historical epoch. 1419–1434 the Hussite Revolution – open rebellion against the existing order of church and state: efforts to make the law of God the highest authority in the life of society (law, politics, morals). The Czechs take up arms to defend their faith (Military leader Jan Žižka and so on), but the movement is ccompanied by ideological disputes between different fractions. The most moderate demands of the Hussites are finally expressed in the so-called Compacts (e. g. wine at communion for the laity, the punishment of mortal sins). 1st Half of the 20th C.